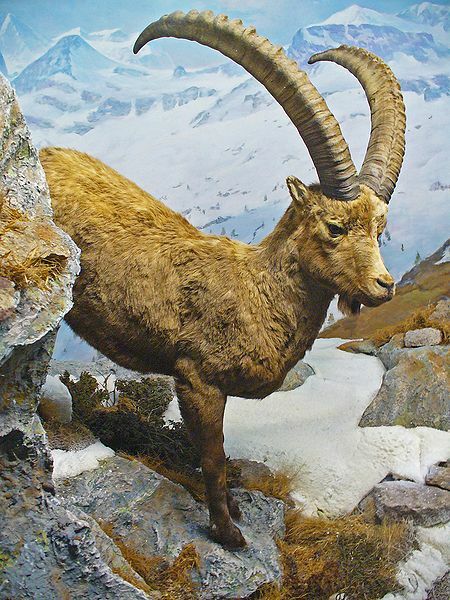 The Ibex is a kind of goat, but different from the one described at page 33. 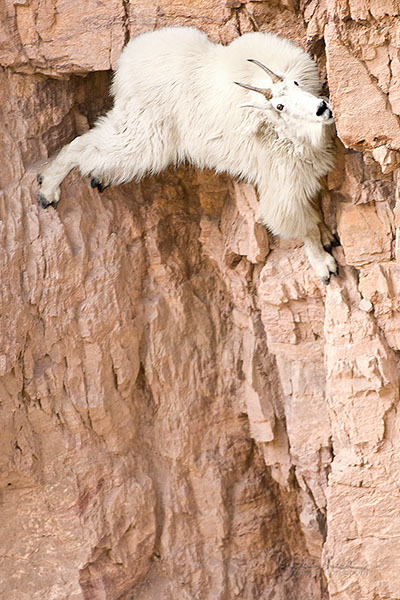 It is sometimes called the Rock Goat, or Wild Goat; and the last is the name given it in the Bible. It resembles the common goat, but is larger, and its horns are much longer; they are sometimes considerably more than a yard in length, beautifully curved, and surrounded by many curious rings or ridges. It lives in places where you would think no animal could get without falling and breaking its neck; you would be frightened to see it sometimes, when it climbs up rough and narrow places, or jumps from one great rock to another. But God has given it just such a kind of foot as it needs; it has a small hoof, something like those of a sheep, excepting that it is hollow underneath, and has a sort of ridge around it by which the animal can cling to the rock, and so keep from slipping. I never heard of such a thing as one of them sliding off the rocks, unless it was pursued by the hunters. 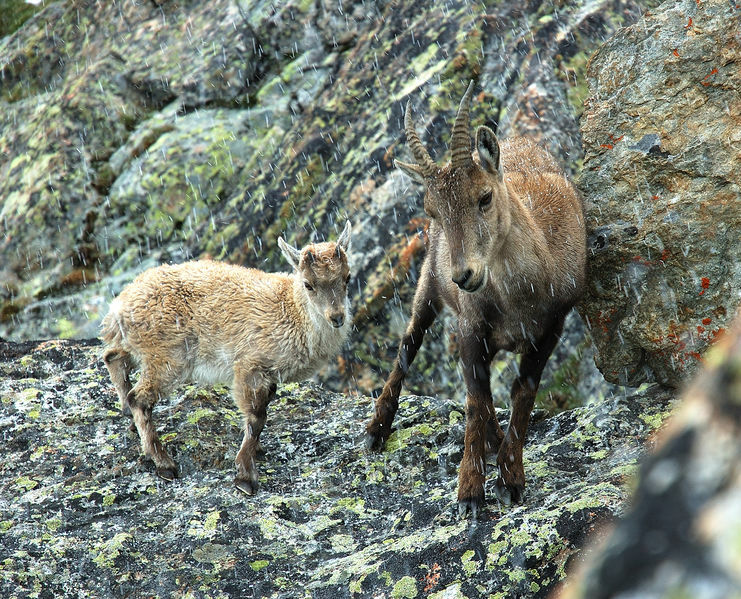 Two goats once met on a high narrow path, where there was just room for one to walk. There was a high rock rising close to their shoulders on one side, and on the other was a place so steep that it would have made you dizzy to look down. They could not go back without danger of falling, and they could not pass each other; what do you think they could do, but stay there and starve? It seemed for a little while as if they were considering about it; at last one bent his knees and laid down, and the other walked safely over his back. The ibex feeds during the night in the highest woods that grow on the mountains; but as soon as the sun rises it begins to climb, eating the grass or whatever it finds, till it has got up where it is too high for trees to grow. They go in small companies of eight or ten, and lie down in sunny places among the rocks while the sun is hot; but about three or four o’clock in the afternoon they begin to go down again towards the woods. They can climb up rather more easily than they can get down, because their fore legs are shorter than the others. Saul took three thousand chosen men out of all Israel, and went to seek David and his men upon the rocks of the wild goats. I should like to have you read with me the whole history of Saul and David in the Bible, so that we might talk about it, for it is very interesting; but now I can only write down what this one verse means. David had been made king over Israel by the command of God; but Saul, who was a very wicked man, was determined to kill him. So David was obliged to fly for his life, with only a few faithful friends; and month after month he hid himself in one place and another, so that Saul might not find him. At last he came to a wild, gloomy place, where nobody lived, near the Dead Sea: it was rocky, and there were many wild goats there. He thought he was safe now; but Saul heard where he was and came after him. One night Saul and his men went into a large dark cave among the mountains, and behold David and his friends were already there; but they were hidden, so that Saul did not know it. David’s men wanted very much to kill Saul, now that he was in their power, but David would not allow them. He only cut off a small piece from the robe that Saul wore, and he was sorry afterwards that he had done even as much as this He did not hurt Saul in the least, but allowed him to go safely out of the cave, though he might have killed him as easily as not. Was not this returning good for evil? This entry was posted in Christian, From The Past, Guest Writer, Kid's Section, Various Things and tagged Bible, Christian, Harriet N Cook, Home School, Ibex, Scripture, Scripture Alphabet of Animals, Wild Goat. Bookmark the permalink.